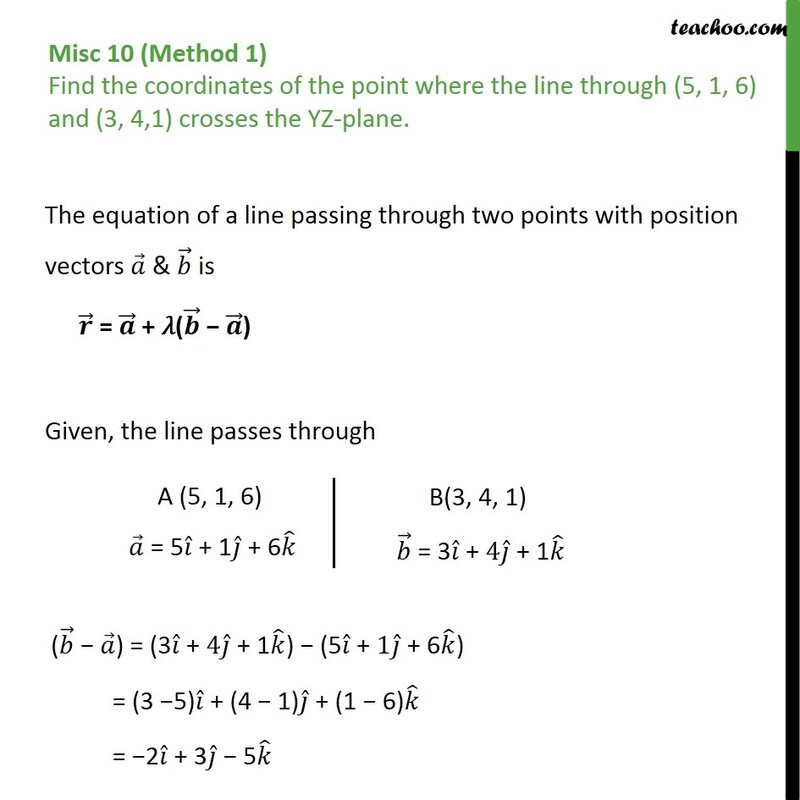 Misc 10 (Method 1) Find the coordinates of the point where the line through (5, 1, 6) and (3, 4,1) crosses the YZ-plane. The equation of a line passing through two points with position vectors 𝑎﷯ & 𝑏﷯ is 𝒓﷯ = 𝒂﷯ + 𝜆( 𝒃﷯ − 𝒂﷯) Given, the line passes through ( 𝑏﷯ − 𝑎﷯) = (3 𝑖﷯ + 4 𝑗﷯ + 1 𝑘﷯) − (5 𝑖﷯ + 1 𝑗﷯ + 6 𝑘﷯) = (3 −5) 𝑖﷯ + (4 − 1) 𝑗﷯ + (1 − 6) 𝑘﷯ = −2 𝑖﷯ + 3 𝑗﷯ − 5 𝑘﷯ ∴ 𝒓﷯ = (5 𝒊﷯ + 𝒋﷯ + 6 𝒌﷯) + 𝜆 (−2 𝒊﷯ + 3 𝒋﷯ − 5 𝒌﷯)	Let the coordinates of the point where the line crosses the YZ plane be (0, y, z) So, 𝒓﷯ = 0 𝒊﷯ + y 𝒋﷯ + z 𝒌﷯ Since point lies in line, it will satisfy its equation, Putting (2) in (1) 0 𝑖﷯ + y 𝑗﷯ + z 𝑘﷯ = 5 𝑖﷯ + 𝑗﷯ + 6 𝑘﷯ −2𝜆 𝑖﷯ + 3𝜆 𝑗﷯ − 5𝜆 𝑘﷯	0 𝑖﷯ + y 𝑗﷯ + z 𝑘﷯	= (5 −2𝜆) 𝑖﷯ + (1 + 3𝜆) 𝑗﷯ + (6 − 5𝜆) 𝑘﷯ Two vectors are equal if their corresponding components are equal So, Solving 0 = 5 − 2𝜆 5 = 2𝜆 ∴ 𝜆 = 𝟓﷮𝟐﷯ Now, y = 1 + 3𝜆 = 1 + 3 × 5﷮2﷯ = 1 + 15﷮2﷯ = 17﷮2﷯ & z = 6 − 5𝜆 = 6 − 5 × 5﷮2﷯ = 6 − 25﷮2﷯ = −13﷮2﷯ Therefore, the coordinates of the required point is 𝟎, 𝟏𝟕﷮𝟐﷯, −𝟏𝟑﷮𝟐﷯﷯. 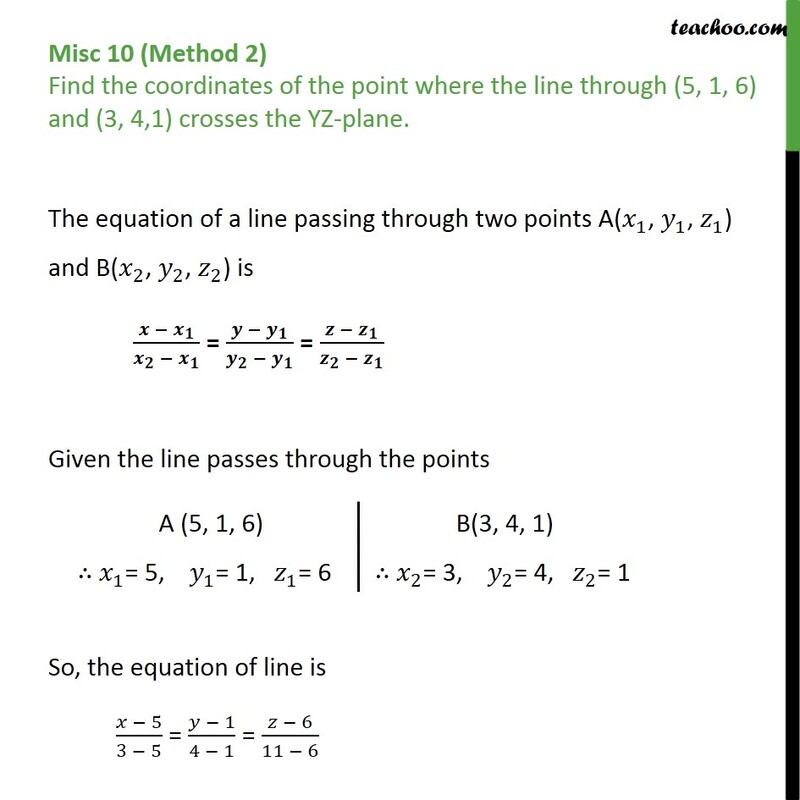 Misc 10 (Method 2) Find the coordinates of the point where the line through (5, 1, 6) and (3, 4,1) crosses the YZ-plane. 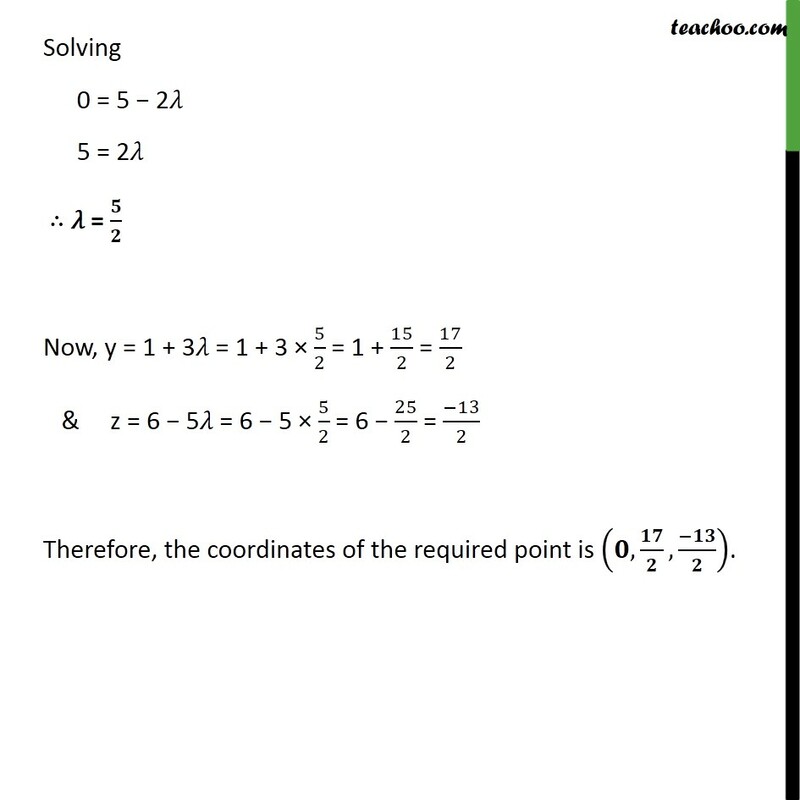 The equation of a line passing through two points A( 𝑥﷮1﷯, 𝑦﷮1﷯, 𝑧﷮1﷯) and B( 𝑥﷮2﷯, 𝑦﷮2﷯, 𝑧﷮2﷯) is 𝒙 − 𝒙﷮𝟏﷯﷮ 𝒙﷮𝟐﷯ − 𝒙﷮𝟏﷯﷯ = 𝒚 − 𝒚﷮𝟏﷯﷮ 𝒚﷮𝟐﷯ − 𝒚﷮𝟏﷯﷯ = 𝒛 − 𝒛﷮𝟏﷯﷮ 𝒛﷮𝟐﷯ − 𝒛﷮𝟏﷯﷯ Given the line passes through the points So, the equation of line is 𝑥 − 5﷮3 − 5﷯ = 𝑦 − 1﷮4 − 1﷯ = 𝑧 − 6﷮11 − 6﷯ 𝒙 − 𝟓﷮−𝟐﷯ = 𝒚 − 𝟏﷮𝟑﷯ = 𝒛 − 𝟔﷮−𝟓﷯ = k So, Since the line crosses the YZ plane at (0, y, z), x = 0 −2k + 5 = 0 2k = 5 k = 𝟓﷮𝟐﷯ So, x = 2k + 5 = −2 × 5﷮2﷯ + 5 = − 10﷮2﷯ + 5 = 0 y = 3k + 1 = 3 × 5﷮2﷯ + 1 = 15﷮2﷯ + 1 = 17﷮2﷯ & z = −5k + 6 = −5 × 5﷮2﷯ + 6 = −25﷮2﷯ + 6 = −13﷮2﷯ Therefore, the coordinates of the required point are 𝟎, 𝟏𝟕﷮𝟐﷯, −𝟏𝟑﷮𝟐﷯﷯.